2004 Maryland State Fair Supreme Champion Bull. 2004 Eastern Regional Shorthorn Show Champion Bull. Vinnie is a son of MF Pacer *x, an Illinois State Fair Grand Champion by CF Trump *x out of Rexlaine Rupert's Romance. 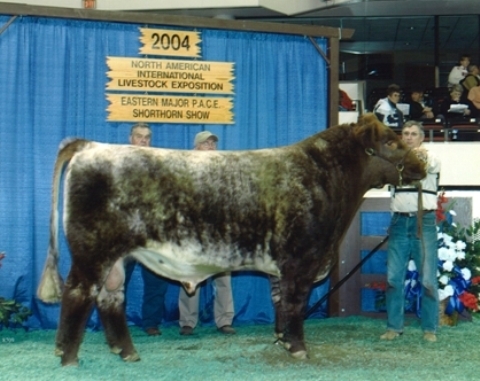 His dam, STZ Little Vi *x is a Nebraska State Fair Grand Champion by JG Red Cloud x out of STZ Vidalia *x. Sire of the Reserve Calf Champion Heifer at Louisville 2005 for the Pitsenbarger Family.